Bigger, brighter and bolder, the SuperSpikie takes the look to another level. Four times brighter than the original Spikie and with the addition of rotating gobos – this effects machine has even more looks to blast through its 165mm lens front. The Zoom is bigger too. From a 3,5° beam to a soft wash at 42°, the CMY or RGBW colour mix looks rich. 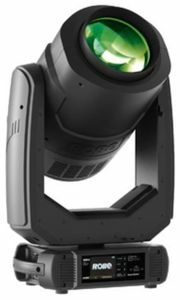 In-air effects using different combinations of the gobos, prism or flower effect feature, make this a versatile stage, set or studio piece. With the ability to mount it in any position, the fast 360° continuous pan and tilt motors add yet another dimension.